What do you mean you’re out of anniversary ideas?! Anniversaries are meant to be joyful celebrations of our love. Time when we get to focus on us and our relationship! What about reigniting the passion! Appreciating our growth as people and as a couple. Yep. All true. They are meant to be all that—but they can also turn into a huge pain. How to celebrate according to your budget? What gift to choose for him or her? How to find the time to organize something when you’re so busy at work / with the children? Worry not! Wisdom Times is here to help with all of this and our promise is this: by the end of this piece, you will have your next—even next few—anniversaries planned. Before we dive in to the “how” of anniversaries, let’s explain the “why” of Anniversaries. Whether they’re wedding anniversaries or relationship anniversaries, they don’t just mark the day you stumbled upon someone. They mark the day you chose someone—and he or she chose you—for certain reasons. As time flies and responsibilities grow, it’s often easy for us to forget why we chose someone. We see their negatives and suddenly focus on fixing those, rather than appreciating the positives. That’s exactly why anniversaries are important. 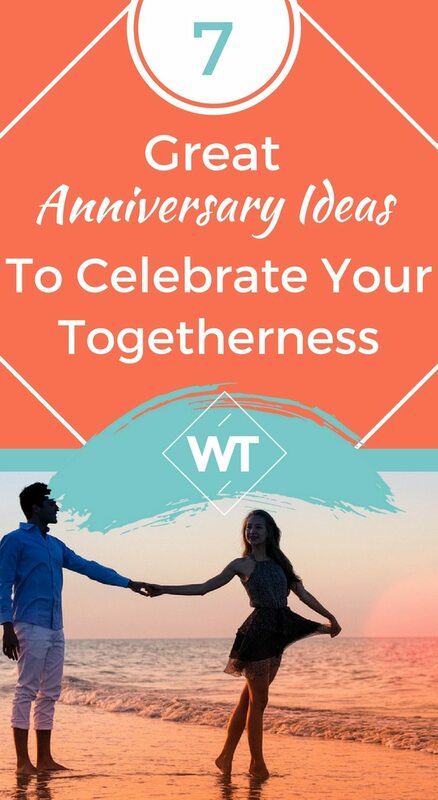 Anniversaries are, ultimately, your chance to remember and honor the reasons for choosing your partner and ideally to choose him or her again. Because if you can re-choose your partner again and again every year, your relationship and love for each other will live forever. Anniversaries are a great excuse for you to spoil each other with little (and not that little) celebrations and gifts. Here are great ways to do just that! While many people give gifts and book their celebrations separately, if there’s something big and rather expensive that you both want, you may just use the occasion to get it. It could be a 60-inch TV or a pool in your backyard—anything that you’ll both enjoy. Don’t agree on something only your partner (or only you) would enjoy! Not that it’s bad to give them what they want, it’s just that deep down you’ll feel like he (she) is the one celebrating the anniversary alone… and that will only create tension in the relationship that will get released one way or another. Whether you choose to plan it together or to surprise your partner with an exotic destination, a trip is always a great way to celebrate anything. In fact, I firmly believe that travel is the only thing you can buy with money that actually makes you rich. Visiting a new place together also happens to match one of my favorite pieces of advice for a happy marriage: do new things together and grow, both as people and as a couple. If you’re planning a short trip that will happen over the weekend (or during a time when you know your partner has no plans and doesn’t have to go to work) you can postpone telling them until the very last minute. Other than that, you can ask them to take days off during the period in question, but don’t tell them why or where you’re going. Plan your budget well. It’s better to go somewhere closer or for short time then to run out of money and welcome negative emotions into your anniversary celebrations. Help him/her pack their bags—they’re not sure what to bring when they don’t know what’s ahead. Go to the place where you first met or your first date was. Prepare him the meal you first made for him. If none of these are possible or relevant, bring in an element from the beginning of your relationship. For example, me and my hubby first hooked up at a party where we drank tequila. So guess what is always present on our anniversary celebrations. Talking about parties, if you two are the partying kind of people, why not party it up on your big night? You can see what events you can find in your city or a city nearby and go to a house party, a concert, or your favorite club. If you can afford it and if you want to, a party trip to Ibiza would be one of the best experiences ever for party lovers. It doesn’t really matter whether you organize that together or you surprise your partner—you choose. What matters is that you do what makes you happy on your anniversary. And even though some people say that going to a party is rather impersonal and a poor choice for an anniversary, if that’s what you enjoy, go ahead! If you are married, you have an anniversary celebration option that many people choose regularly: repeating your vows. Some married couples even do it every year! And while you can live the rest of your live without ever repeating your vows and still enjoy a healthy and happy relationship, it is a fun way to re-create your wedding in a more casual, less stressed environment with only a close circle of friends and / or family. So if you’ve ever wanted to see yourself in a different wedding dress, to make your children part of a wedding experience or to get married in a totally different way than you did before… repeating your vows is an awesome option for you. Hint: it’s perfect for 10th, 20th, 30th anniversary. The possibilities are endless, especially since new fun things to do are being invented every day. How about flying over water with a jet-pack? Or jumping off cliffs wearing a weird flying squirrel costume? Those are definitely not my things, but if they are yours, congrats! 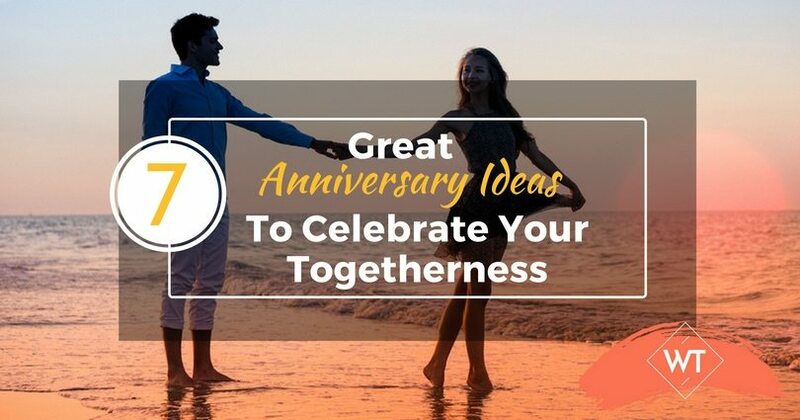 You just found the perfect way to celebrate your next anniversary! So you chose the way to celebrate. But what about the gifts? Here are a few great ideas, most of which are suitable for both men and women. You can choose the perfect one according to what your partner likes and what your budget is. And if you find something you like in here, don’t forget to casually show this article to your loved one. An obvious choice for women, yet one that most men forget as an option. A beautiful piece of jewelry will earn you passionate gratitude from practically any woman. If you can afford it, get something with precious stones. Ok, but what kind of jewelry do we give to a man? The most obvious—and probably the best—choice would be a nice watch. Gordon Bethune, one of the top executives in the US for the past few decades, says that “Watches are the only jewelry men can wear.” And while we don’t fully agree with him, no man would refuse a Rolex (for example). What else for men? It really depends on your partner’s style, but you can choose between rings, bracelets, or maybe even a necklace. These types of gifts are more desirable by men, but this doesn’t meant that I didn’t flip out when my hubby got me the latest iMac a few months ago. Most technology gifts require a bigger budget, but there are also a bit more affordable options like professional hairdryer or photo-epilation unit (for her) and high-quality headphones or hoverboard (for him). Just consider what your loved one would like and what your budget is and do some quick online research. You should be able to choose something awesome rather fast. This is probably not the best solution when it comes to anniversary gifts. Most couples I know, including me and Victor, rarely buy clothes for each other even though they’ve been together for years. Even if you know someone very well, you could always be wrong about whether a certain piece of clothing would look good on him/her, whether it would fit and whether your partner will like it. So why am I suggesting clothing as one of the options here? Simple. There’s one exception to this no-clothing-as-a-gift rule. When you know for a fact that your partner likes certain piece, but still hasn’t bought it for whatever reason (there wasn’t the right size in the store at the time; there wasn’t the right color; he/she considered it too expensive), then go get that and you’ll be the hero of this year’s anniversary! Does your partner like to read? Well, it’s all clear then! You might think that there’s no way you can get away with just a book—and you’re right. But there are so many options out there for book lovers. First of all, you can get your partner a special edition of a book they like. Maybe an illustrated one, or one with an autograph, or even one with an “extended version.” You can get the latest from your partner’s favorite author. I’d be so happy if I get the fancy edition of J.K. Rowling “The Cursed Child” on my anniversary! Another great idea is to get your partner the full pack of a certain series: Game of Thrones, Harry Potter, 50 Shades of Grey, Lord of The Rings + The Hobbit + The Silmarillion, all the Jack Reacher books. The options are endless. And if you’re still not sure what to choose exactly, go into a bookstore and look around. You’ll get some inspiration eventually. Subscriptions for movie, TV show or music services are becoming popular gifts, according to my sources. And it makes perfect sense! Why not give your partner the opportunity to enjoy the latest of the movie and music industry while relaxing anywhere, anytime? Not all services are available in all countries, so rather then me suggesting such subscription services, it’s best that you google it and find what fits your needs in the search results. We already mentioned these options when we were talking about celebrating, but even if you choose to celebrate with a romantic dinner, you can give your partner an experience or a trip. And the best thing about it is you can include yourself in the trip or experience, so there you have it: you’ll be giving a gift to yourself too! Also, if your partner has a hobby that requires supplies, this could be a great way to surprise them. For example, I love painting. But every time I’m about to get the whole painting package: tripod, brushes, canvases, paints, I notice it’s all so expensive and I end up drawing with pencil on printer paper. Does your loved one have a hobby that you can help with? Maybe a microphone and/or karaoke machine would be great for someone who loves to sing. A pool subscription for someone who loves to swim. You get the idea. If your partner is an art lover, than the experience of art would be a great gift for him or her. Whether you choose a beautiful painting or a CD of classical music, art lovers will deeply appreciate it and truly enjoy it. When it comes to art, another great option is finding a way to give custom art—something made specifically for your partner. You can get a painter to create a portrait of you two, or draw the place where you first met. Or, if you enjoy doing any kind of art, you can make something that they would love as well. Like Tony Robbins says, if you don’t grow, you die. Growth-related gifts are one of my personal favorites, because you don’t just give something that results in momentary joy. You give something that may result in changing your partner’s—and your—life! If your partner is a writer, book them writer’s retreat. If he is an entrepreneur, send them to an awesome business event. And if you don’t know what exactly they want to pursue, send them to a Tony Robbins event! They’ll figure it out for themselves. And whatever you do, don’t forget this: how exactly you celebrate your anniversary and what exactly you choose to give as a gift is not as important as showing love and respect for the person next to you every single day. This way, you will have plenty of anniversaries to do all the things in this list—and more. From me and the entire Wisdom Times team: Happy Anniversary!